God Mode is Old School Game’s third person co-op shooter for Windows, PlayStation 3, and Xbox 360. The game is a throwback to old school shooters where players fought off hordes of the undead and demons instead of fighting a war in a generic Middle Eastern country. God Mode is light on the story, instead having a simple premise and a variety of darkly funny ways the player met their untimely end. 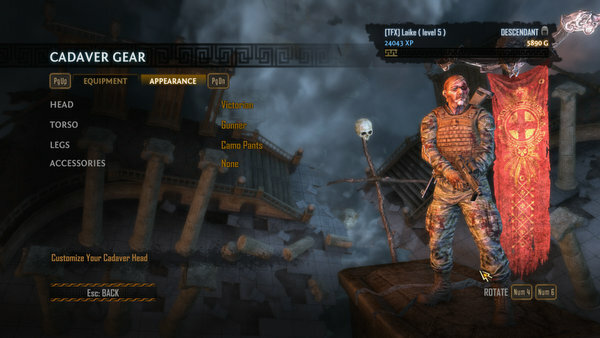 The player has died and is now in Hades or “hell in a toga” explains the narrator. Now the players must navigate ancient Greek and Roman themed mazes while fighting off the undead hordes to escape Hades and become an immortal. Most of the stories of the player’s untimely demise range from “Wow, I feel bad chuckling at this” to downright funny, but a few fell into the not funny category. 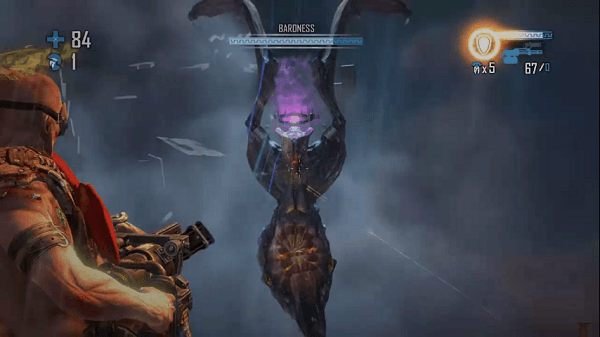 God Mode is a simple third person co-op shooter. There are some extensive player customization options including a variety of skins, weapons, and abilities. All the classic weapons spanning multiple genres of shooters make an appearance in God Mode including the shotgun, assault rifle, plasma pistol, rail gun, and crossbow. The weapons have seven possible upgrades that are limited by level and cost in game gold. 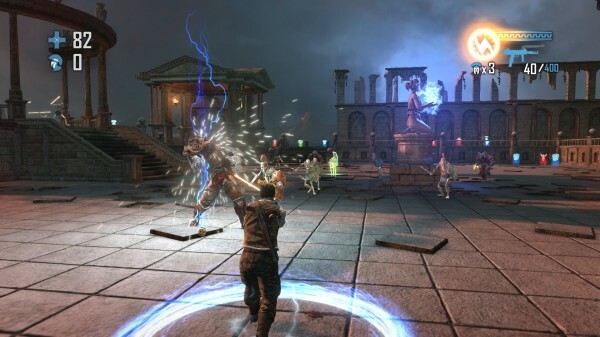 Each player has access to a variety of abilities that can be activated when the player’s rage bar is filled. The abilities effects are varied in their utility. 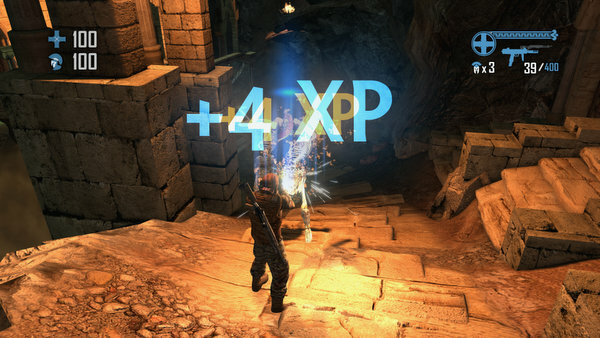 Co-op players can choose teamwork friendly abilities like Salvage or solo players can opt for abilities like Shield that protect them for a limited period of time. The weapons and skills require a hefty amount of experience and gold to purchase. Although I found it reasonable to hold back the weapon upgrades and skills until the player achieved a certain level, I found locking away the different weapons in the same manner was rather frustrating. Weapons of choice is an extremely personal decision. What benefits one player’s play style may hinder another. In the beginning, Players are stuck with a submachine gun and a double-barreled shotgun and slowly grind out the necessary gold and experience for other weapons. Five maps ship with God Mode. 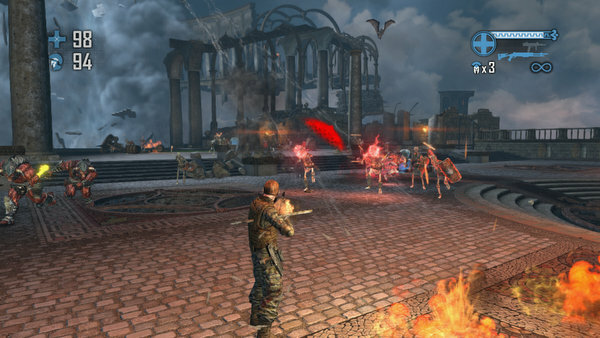 Each map is broken up into several small sections where several waves of undead horde are thrown at the players. Being an old school styled shooter, the regenerating health system made popular by Call of Duty 2 is out the window in favour of traditional health and armour pickups. Health, armour, and ammo can be picked up at set places on the map or found from the corpses of dead foe. Occasionally bonus gold is appears on the map after a breakable object like a pot is destroyed or a large enemy like a Minotaur dies. At the end of each map, players are teleported into a peaceful temple with respawning gold pickups and friendly fired turned on. These either turn into a no holds barred firefight for every bit of gold or a polite run around the room. There is a large variety of enemies to do battle against visually, but end up breaking down to mini bosses, chargers, melee, and ranged enemies. Although the player can roll out of the way of incoming attacks, the gameplay often boils down to backpedalling endlessly while firing round after round of projectiles into the enemy. Boss fights had very little to make them unique beyond being a bullet sponge. God Mode has several modifiers that make the game more interesting. Each section of the maze has a Test of Faith modifier that can range from silly to helpful to downright deadly. Similar to Halo’s skull modifiers, Oaths provide an experience and gold bonus at the cost of a challenging modifier like less effective health pickups. These modifiers help breathe a little life in an otherwise bland shooter. I am not sure if Old School Games set out to reinvent the wheel or never picked up a modern shooter made in the last 10 years when designing the controls. PC players will need to go in and change the default keys right away as keys as the default binds are non-standard. The slider bars seem to have lives of their own. One would expect that when clicking on a slider bar, the slider moves to where the mouse pointer is or the closest notch. Instead, the slider moves where ever it feels like and the mouse button needs to be held and dragged around until the slider falls into place. There is no rhyme or reason in the response of any slider in the options. After the poor experience I had with the PC controls, I figured that maybe the controller would provide a better experience. I was sorely disappointed. Console shooters these days tend to follow three basic layouts, Call of Duty, Halo, or Gears of War. God Mode provides two layouts available in right or left handed modes, a strange default one and a FPS layout that vaguely resemble Call of Duty’s control scheme. God Mode looks good. Ancient Greek and Roman mythology heavily influence the design of the maps and enemies. The game runs smoothly on the PC without any frame rate drops. 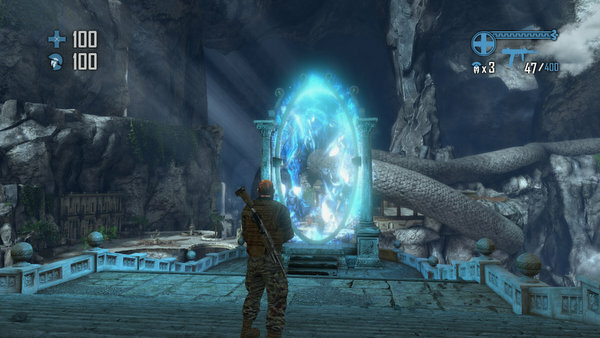 There are a wide variety of character customization options, but most of them are rehashed versions of a small handful of base designs and they are almost all locked away behind level and gold requirements. God Mode’s audio experience is excellent until other players are involved. The narrator reminds me of Hades from Disney’s version of Hercules. The sound effects sound great and the background music works. However, the terrible VoIP implementation makes playing with random players extremely irritating at times. There is no option for push to talk microphone controls or way to disable the in game VoIP in favour of third party solutions like Teamspeak or Mumble. Instead the microphone defaults to whatever Steam uses as the microphone and transmits whenever it hears sound. Even worse is the fact players can only be muted in the lobby. I could not figure out how to mute players while in game. The crowning failure of God Mode’s audio is the fact the VoIP sounds laggy no matter how good the connection. Players cut in and out and carrying on a conversation is practically impossible. 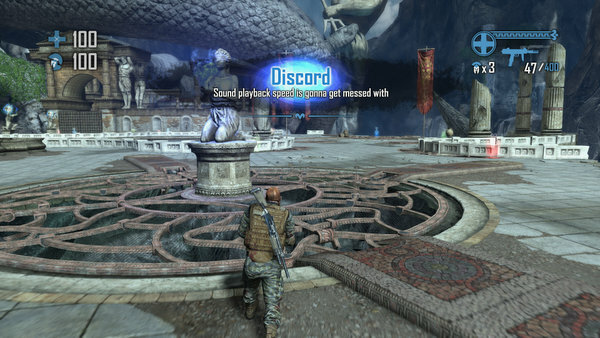 Considering the game is billed as a co-op shooter, the terrible VoIP is inexcusable. 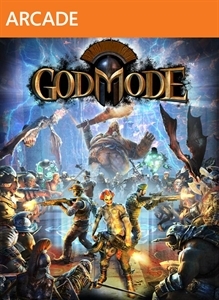 God Mode had a lot of potential to be a fun arcade shooter. The ideas were sound, but Old School Game fell flat on their face on execution. Although the game has some sound ideas, the lousy controls, terrible VoIP implementation, and boring gameplay hamstrings God Mode.